Each year we hire youth from partner schools or programs in Orleans Parish to participate in our paid, five-month Leadership Program. Youth spend 50% of their time learning and practicing sustainable agriculture on our two-acre farm. They plant, cultivate, harvest, sell and donate nearly 25,000 pounds of produce. Youth distribute produce through our 90-member farm share program, and sell directly to consumers at the Crescent City Farmers’ Market. The other 50% of their time is spent in educational workshops and skill-building activities on site, at partner organizations, and on field trips. At Grow Dat we are committed to an ecosystem of youth leadership development in which Real Talk, Real Work, and Real Accountability, work together to inspire transformational leadership development in youth and young adults. 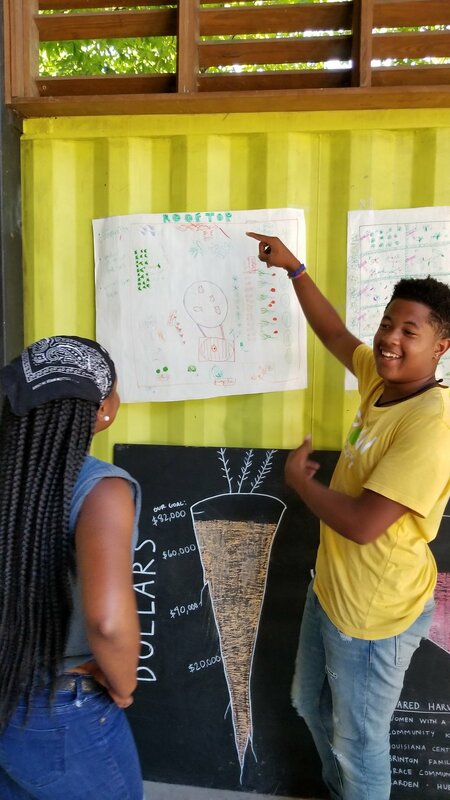 Grow Dat youth engage in Real Work through weekly farm work and active participation in our workshops centered around our three educational pillars-- Food Justice, Community Leadership, and Sustainable Agriculture. Real Accountability holds youth and staff accountable to our guidelines and standards system and is designed to protect shared goals and individual relationships. Real Talk is our communication system built on of kind and honest communication about each of our strengths and opportunities for growth. Youth engage in Real Talk with their Crew Leader on a biweekly basis. Learn more about our ecosystem approach to youth development.